My education is near and dear to me. I don’t consider myself a dropout. It’s more a title that others have slapped on me. Often it is those same people who figure that I didn’t respect my schooling or thought that I was above it. That’s not the case at all. I loved school. I miss school. For me, school was the perfect place to meet friends, play soccer, and get into some high quality mischief. Of course, it was also a prime place and time to develop as a person and learn confidence, failure, when to cheat, and integrity. Perhaps atop that list, I’m very grateful for one specific eternal truth taught to me by Andrew Lewis : Sincerity. As I learned sincerity, it krept into every part of my life including my education. It was sincerity to myself that lead me to realize that I was at school to gain skill, an education, and relationships, and not just one of those stampy things. It’s important to realize that my path isn’t the path for everyone..Just like the path to a degree wasn’t the path for me. My dear friend Cory is preparing to become a Doctor. He darn well better be degreed to the fullest if he ever wants to come at me with his scalpel ; ) That’s why I speak of sincerity. Because it takes sincerity of life to realize and confidently follow your unique path. I initially was part of the Product/Industrial Design program at BYU. It was very hard for me to silo off from all other departments when there was so much I eagerly wanted to learn about. After a year, I decided to leave the I.D. program and never join another major. The fact was, there was no one major that contained everything I wanted to learn..Or even contained 100% of classes that I was alright with learning. Not wanting to waste even a credit’s worth of time, I created my own beautifully crafted schedule of pure brilliance. Most classes were senior level classes that required many pre-reqs in order to join, but the pleasant truth was, professors had a hard time turning me away as I persistently attended their classes and proved myself to be amongst if not their most attentive and passionate student. For the most part, my professors came to love me, while most department heads began to hate me. This process of sincere and passionate learning seriously threw my personal education and skill development into hyper drive and I found myself excelling personally in all degrees of life. My startup venture, Scan especially began to do well. Three months after launching, our iOS app had over 1 million downloads. It was about that time that investors from Silicon Valley began reaching out to us. That’s of course an adventure of a story in itself, but upon closing a deal of $1.7 million for 20% of Scan, I was faced with the opportunity to dropout of school and focus my full attention on Scan. It was a blessed dilema between the greater of two goods. I didn’t want to dropout. I didn’t want to leave my friends at school. 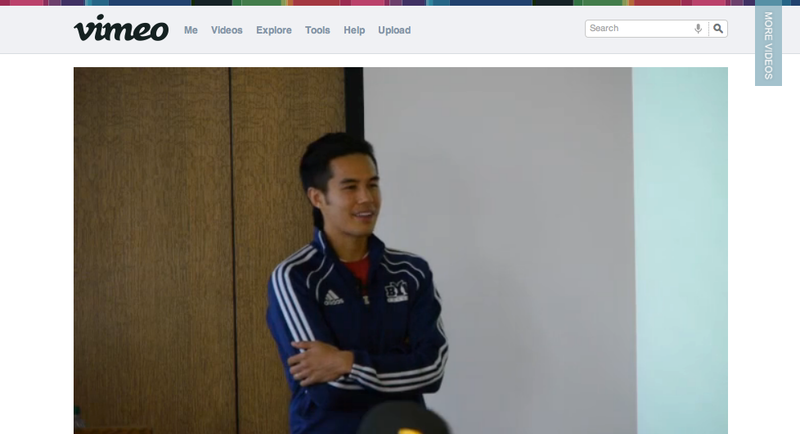 And I didn’t want to stop playing soccer for BYU. The choice came down to the personal responsibility I felt to Scan, my co-founders/friends, investors, supporters, our users, and really the incredible potential before us. You’d think printing “CEO” on my business card would have matured me overnight. Unfortunately that hasn’t been the case. So you can imagine my sinister pleasure when the department heads (mentioned as “haters of me” above) of BYU’s Business School reached out to me asking if I’d be willing to come and keynote to their students. Out of respect I won’t disclose the full deal that went down here. Out of disrespect I will continue with this story. As the event was about to begin and the department head was about to introduce me, Morgan and I were standing by, iPhones on video, just in case they went through with the full bio. To my pleasant surprise, they read the complete bio word for word. With that bit o’ fun past, it was time to focus at the task at hand and put the needs and education of the students present first. In all honesty, the opportunity was very rewarding. It was fun to have many former classmates in the audience. I was also especially grateful to have Morgan, co-founder Ben Turley, and my brother Brennen (far left with the baby in the pic below) present. I had planned for this to be a 1-2 sentence blog post. Turns out that education is something I’m quite passionate about. Be sincere. Work hard. Believe in yourself. Here’s to not letting school get in the way of true education. 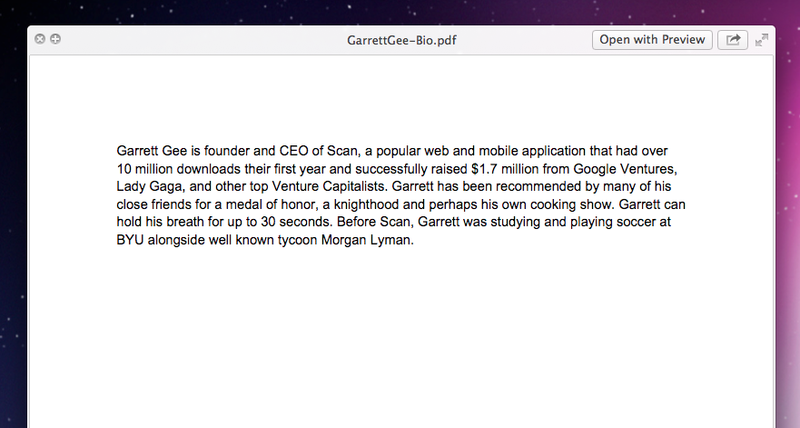 This entry was posted in Entrepreneurship, Personal Journal on Apr 4, 2012 by garrettgee.